Hi folks sorry about this being my first post but I was looking to enquire as to how much you would charge for a small job. Sometime next month I?ll be starting to work on a TBS game similar in essence to Space Hulk. It?ll be in the prototype stage for a while I reckon but I really find it helps to have something that can help visualise with what the end product might end up looking like. 1] Human character with 4 directions. Front, back, 2 sides. 2] 2 Weapons for the Human that are interchangeable. 3] Enemy of some description. I?ll leave the creativity up to you as I?ve not settled on anything personally just yet. Also in 4 directions. With a weapon of some kind. The dimensions I haven?t settled on just yet but imagine them to be 80x40. In the end the game will have 8 directions but for now while I work on things just looking for the 4. Aesthetically for the human sprite I?m sort of partial to the Imperial Guard style that Games Workshop have. Something along the lines of the Kasrkin squad but again however feel free to use your own creativity. Attached an image of one of the troops from GW website. 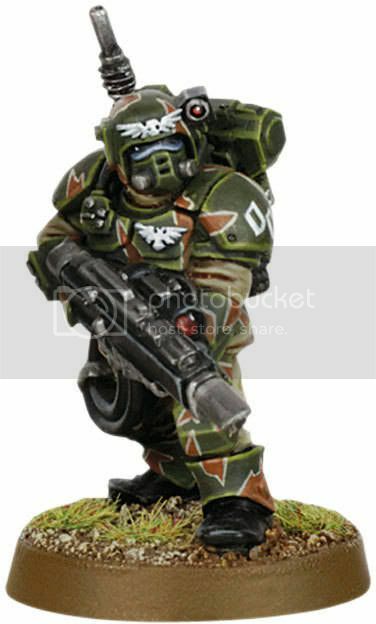 I?m looking for a more human styling rather than the typical space marine thing. One last thing sort of as a 2nd estimate. If the sprite was to be animated walking in those directions how much would that be.